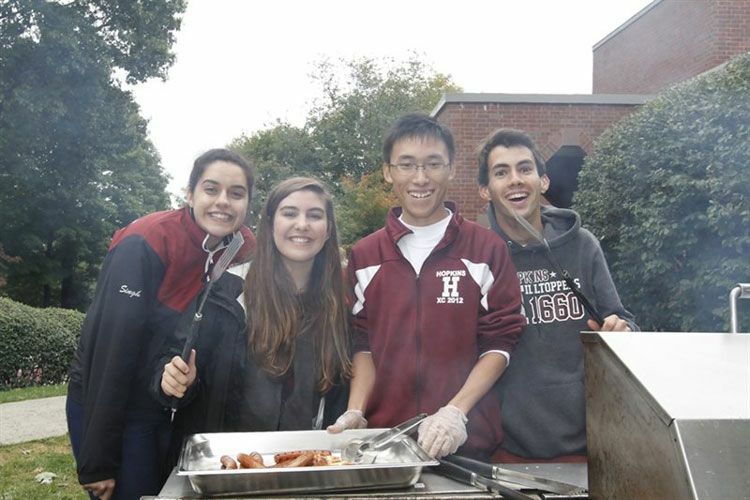 On February 23, 2016, Sara Chung ’19 conducted the following interview with Will Simon, Student Council President, as he concludes his final semester at Hopkins School. What are some of your reflections from the past year, including the Council’s major goals and accomplishments? It’s hard to describe the success of our Canned Food Drive. There are the numbers - we raised over $97,000 dollars and spent over three thousand hours of community service - yes, those are big numbers. But it’s hard to really see if they mean anything to people. I’ve seen those numbers increase through the course of my six years at Hopkins, but that matters less to me than hearing our student body talk about it. Events like the Can Jam and the Yule Ball created a lot of buzz and excitement and students were glad there were other ways they could give back. The lasting impact of the Canned Food Drive isn’t the amount of people we feed, which is definitely important, but what people remember and take away from it. It’s about how you felt about fundraising, because hopefully that encourages people to help in the future. I want the Canned Food Drive experience to be a lasting memory for people, hopefully in a very positive way. Something nice about this year, reflecting the spirit of the Student Council, was discussing issues about how to be better as a school. The Conversations on Race made people more willing to talk about things that are very important to this school and community. It didn’t have to be a topic about race to be a conversation to improve something about Hopkins, but talking about race has really been a springboard to what I hope can be conversations about other things that we can address, whether it’s community issues or global issues. I think that the idea of having school wide conversations is an important concept and will have a big impact to this school community in the future. How do you think the council can build on your group’s accomplishments of this past year? Is there anything specific that you would want them to focus on? I feel like every year the Student Council gets better at doing the things it used to do, and each Student Council President will add their own features. This year, we added Can Jam and the Haunted House. The next President and Council will likely build on those events, refine them, or they’ll decide that we don’t really need them and try something new and exciting. That happens every year and it’s a natural progression. We had some great events this past year and I trust whomever Hopkins elects to be smart enough and care about the school enough to create their own legacy rather than just building on mine. What are some of your favorite moments as the president of the Student Council? The Haunted House to benefit the Food Bank took place on Friday, October 30, and was our first successful “haunted house” event with great participation by Hopkins students. Rushing from Lovell to Upper Heath after helping with setup, and seeing a line forming for tickets for the Haunted House was really satisfying and a relief, as we were unsure of how many students would be participating at the event. I was pleased to see so many students at the event to benefit a great cause and interact with other students. The willingness of the Hopkins community to get together and act as a whole is something I can’t speak highly enough of. Moments like looking out at everyone from behind the band at the Back to School Bash, and seeing everyone coming together were very special to me this year. The highlight has to be presenting the check to representatives from the Connecticut Food Bank, which recognized all the hard work and contributions by our student body for such a great cause. Do you have any advice for the next Student Council President? Each president will have their own goals and priorities. Obviously, events like the Canned Food Drive are school wide efforts that can’t come from any one person. We’ve had presidents in the past who cared more about other things than the Canned Food Drive, and we ended up with lower numbers those years. However, we ended up with other benefits due to the focus on other activities. The new President should decide on what is important to the Council, set their goals and priorities, and then unapologetically attack that agenda. Whether it’s the Canned Food Drive, activities, the lunch schedule, whatever it is, don’t go half way with it. What would you like to be remembered for as the 2015-16 Student Council president? I’d like to be remembered as someone who was passionate and cared about Hopkins and the student body. I really enjoyed spending considerable time with the Student Council and student body, being their advocate, and interacting with Ms. Riley and school administrators on behalf of the student body.